"Wonderful counsellor, Mighty God,Everlasting Father, Prince of Peace." (Isaiah 9:6). On the 22nd day of Advent the #AdventWord2018 is #persist. 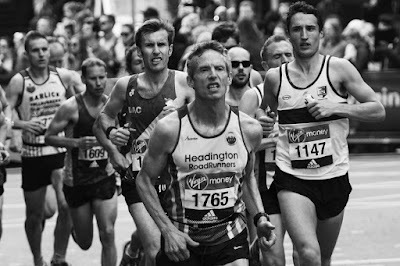 To run a marathon you have to persist. You have to persist through months of training when you wonder if it will be worth it. And then there is the day of the race itself when those who are determined to reach the goal however long it takes are rewarded. Mary, the mother of Jesus, along with Joseph, had to persist through a rocky hilly journey to Bethlehem for a compulsory census and tax payment. They had to persist through whatever worries they may have had about finding accommodation and paying the tax. 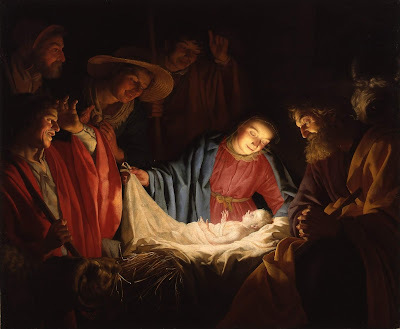 They had to persist in faith that Mary's baby would be the One got promised, the Saviour. If that was really the case, why didn't God make it easier for them? Mary had to persist through the pain of labour, probably knowing that many other women died in childbirth and the infant mortality rate was high. Humanly speaking, there was no guarantee of a rewarding outcome. 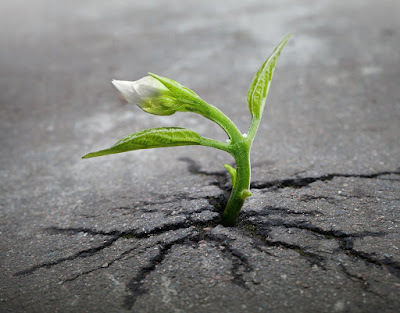 When you think about God breaking into human life, what do you expect? Earthquakes? Wind? Fire? Storm? Upheaval? When you think about one sent from God, who comes to save, what do you expect? A strong superman? A warrior at the head of a conquering army? Advent is about preparation for God coming to our world in Jesus Christ. Today's #Advent Word on this 21st day of Advent is #expect. When you think of Christ's coming, what do you expect? It's the 20th day of Advent and this year Advent only has 24 days. If you are wondering why, then take a look at Preparing for Advent 2018. We've reached that stage in Advent when even those who try to observe the whole season of Advent, find that Christmas seems to be so almost here that we just allow Christmas to overtake Advent. I certainly found that to be true when thinking how to respond to today's Advent Word #sign. 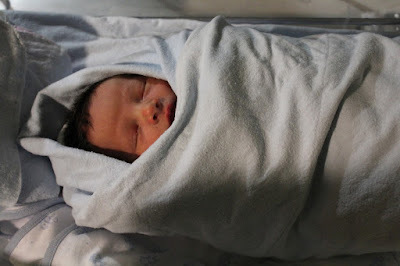 "This will be a sign for you: you will find a child wrapped in bands of cloth and lying in a manger." Luke 2: 12 (NRSV)What an unlikely sign of universal good news! It's the 19th day of Advent and today's word in the #AdventWord2018 online calendar is #ablaze. 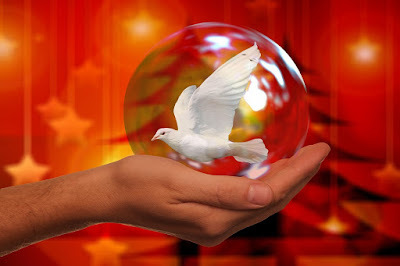 So, why do I choose an image of a dove against a background of fire? It's because much Advent focus relates to John the Baptist. John preached with fiery passion to prepare the way for the coming Christ. John declared that one was coming after him who will "baptize you with the Holy Spirit and with fire." (Matthew 3: 11). In Matthew's gospel that prophecy is followed by John's baptism of Jesus in the river Jordan. As Jesus came up from the water "he saw the Spirit of God descending like a dove and alighting on him." (Matthew 3: 16). 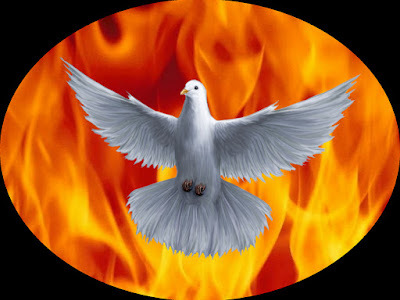 Dove and fire are contrasting metaphors for the work of the Holy Spirit who both brings peace and sets hearts ablaze with love for God and neighbour. What do you do when you're tired and stressed? You relax in a bath or pool to wash aware the cares. What do you do when you need a kick start in the morning? You wake yourself up with a shower to wash and revive you. All of those are wonderful gifts for those of us with the privilege of easy access to fresh, clean water. 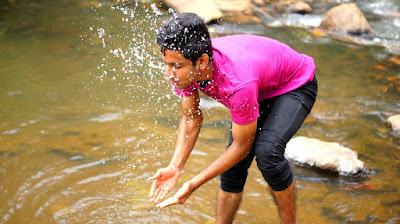 After a bath, shower or swim, one can feel like a new person, ready to face whatever comes next. On this 18th day of Advent the #AdventWord2018 is #wash, a word that evokes so many images and memories. Today's #AdventWord is #ancestor. That word reminded me of the search for ancestral roots that I have been engaged on for the last few years. This photo is a gravestone in old St Mungo's Churchyard in Penicuik, Midlothian, Scotland, where many of my Scottish ancestors were buried. Amateur genealogical research has become a popular hobby, in recent years. I have found it fascinating. It has helped me to understand more about my own family and the places and events that shaped my forbears' lives. As I have perused handwritten Christian baptism, marriage and burial records I've become more grateful for the heritage of Christian faith that has been passed down to me through many generations, including my grandparents and parents. By the grace of God, that faith has become real to me. Thanks be to God. I haven't much time today, but later I may update this post with a reflection about Abraham, seen as the faith ancestor of Jewish, Muslim and Christian people. Today's #AdventWord 2018 is #sing. On this 16th day of Advent, the word sing' follows on well from yesterday's word 'rejoice'. 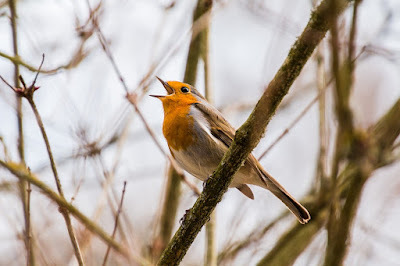 I wonder what this robin is singing? What message are other robins receiving? The word 'sing' reminds me of one of my favourite Psalms in the Bible. The Psalms are a collection of ancient songs, used in Jewish and Christian worship. On this 15th day of Advent the #AdventWord is #rejoice. 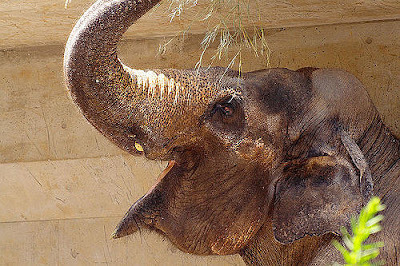 This elephant seems to be rejoicing in the moment. That is why I chose it for today's word 'rejoice'. Today happens to be the 3rd Sunday of Advent, sometimes called 'rejoicing Sunday' or 'Gaudete' Sunday. Some churches indicate that this is a Sunday to rejoice by using rose coloured vestments or lighting a pink candle among the otherwise purple or blue Advent Candles. For those churches that follow the Revised Common Lectionary, at least one of the Bible readings used in church on this 3rd Sunday of Advent gives a reason to rejoice or has a call to be joyful. It provides a more upbeat tone in what can be a solemn season. On this 14th day of Advent, the #AdventWord2018 is #prepare. 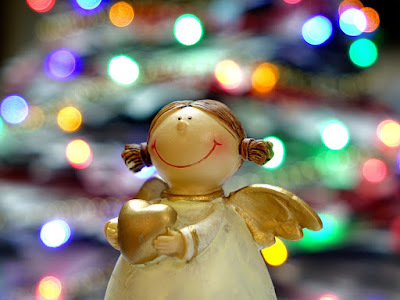 To prepare for Christmas is a task that can be enjoyable, stressful, sad or exciting. It depends on your situation just now. One of my happy childhood memories is helping to stir together the ingredients for a traditional Christmas pudding. 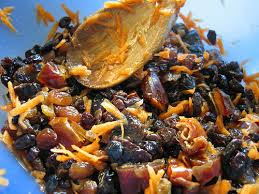 I still love the smell of a mixture of dried fruit soaking in rum or brandy, before the other ingredients are added. Ideally this Christmas pudding preparation should be done a long time before Advent begins to allow the cooked pudding to mature for a few months. The garden is beginning to look tidy for the winter. The necessary pruning is done, ready for a time of dormancy before the new growth of spring. The vine now looks dead, but it is not. It's life is hidden for now. I trust that the fresh shoots, leaves and eventually grapes will appear during 2019 as they have every previous year. 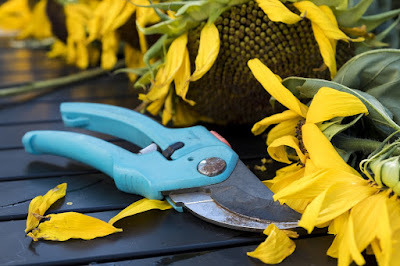 To prune is a gardener's act of care, of cleaning up what is unproductive or getting in the way of better growth. #Smooth is the word for the 12th day of Advent in the #AdventWord2018 online calendar that I am following this Advent season. 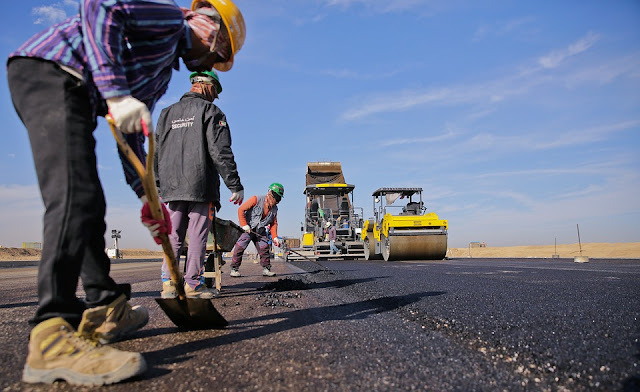 Linking it with yesterday's word 'rough' and the Advent theme of preparing a way, today's word 'smooth' reminds me of words from the prophet Isaiah. Those words are quoted by gospel writers (e.g. Luke 3: 1 - 6) to describe the mission of John the Baptist who called for all obstacles to be removed that would get in the way of revealing the glory of the Lord, seen in Jesus Christ. #Rough is the #AdventWord2018 for this 11th day of Advent. The word 'rough' reminds me of rough roads like the one in this photo. 'Rough' makes me think of hard times, desperate situations. 'Rough' also makes me think of the Advent theme of preparing a way for Christ. That preparation is about making rough places smooth, challenging injustice and oppression. That preparation work is in itself a rough and difficult task, not at all comfortable and often dangerous as John the Baptist knew to his cost. Today's #AdventWord2018 for the 10th day of Advent is #go. The word 'go' got me thinking about the last journey we each have to make, that is death. 'Go' also reminds me of the many ways we need to 'let go' in life, sometimes to let go of things, attitudes or habits, in order to make room for something better. 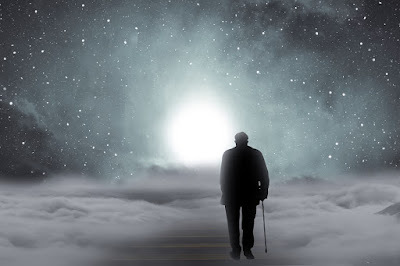 The final letting 'go' is the letting go of life as we go into death. For Christians, that final letting go into death, is in the 'sure and certain hope' of making room for something far better in the resurrection to new life. Most of us would hope to 'go in peace', as old Simeon felt he could do when he held the child Jesus in his arms and saw in him the light that would lighten all nations. You can read more about that in Candlemas 2018. For the 9th day of #AdventWord 2018, my response to today's word #cry is a prayer from the Bible. answer me speedily in the day when I call." And here is another version of that same prayer, set to music by the French composer Jacques Berthier (1923 - 1994). It is a sung prayer from the Taizé community in France. In this short video by Maureen Ward the prayer is accompanied by some lovely peaceful images. If you do not feel the need to pray this for yourself, perhaps you could pray it for someone else who cries today and is in need. On the 8th day of Advent the #AdventWord2018 is #wild. Today also happens to be the 2nd Sunday of Advent. Bursting on the scene, through the gospel reading on this day,is a man who emerges from the wilderness and preaches around the Jordan river. His name is John the Baptist. He is a cousin of Jesus. 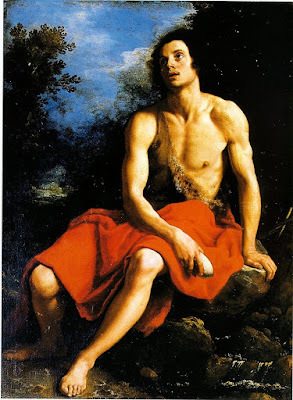 John the Baptist dresses in camel hair and leather and eats locusts and wild honey. There was nothing unusual about either his dress or his diet for people living in that wild desert region. What I see as most 'wild' about him was his fearless, passionate preaching.John the Baptist was wild in the risks he took in his prophetic preaching. Crowds come out to be baptised by him and he calls those coming, 'you brood of vipers'. This was because he saw that some of those who asked for his baptism of repentance, were not repentant, not willing to change the way that lived and so show the genuine fruits of repentance. During Advent, Christians prepare for the coming of Jesus. That coming happens in the past, present and future. Because Jesus entered our world as one of us in the past, we can know him in the present and anticipate his future coming when God's kingdom, of justice, mercy and joy, will come on earth as it is in heaven. Advent waiting in hope for the coming kingdom isn’t passive. In many churches last Sunday the gospel reading was Luke 21: 25 - 36. In that Bible passage, Jesus calls us to "be on guard, alert and ready". Today's word for #AdventWord2018 in the online calendar I am using for daily reflection is #alert. So how can we be alert? 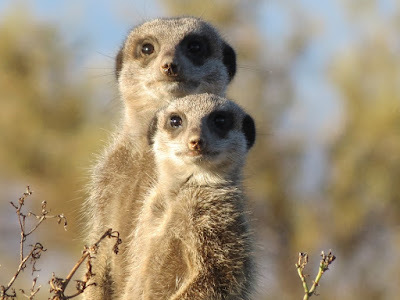 As attentive to what is around us as the meerkats on guard at the head of this post? How can we, in Jesus' words, 'be on guard, alert and ready'? 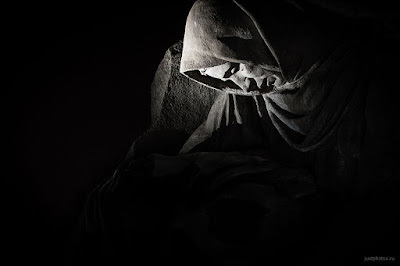 Yesterday's Advent post was about night and its associated darkness. To state the obvious: when people are in darkness they need light. On this 5th day of Advent the #AdventWord2018 is #light. In the Bible 'light' is often used as a symbol both of God and of the people of God. Light is used to describe God bringing salvation to people who walk in darkness so they may have the light of life. The opening of John's Gospel describes Jesus is as the true light coming into the world and rejected by some who prefer darkness to light. "...I am the light of the world. Whoever follows me will never walk in darkness but will have the light of life." John 8: 12 (NRSV) You may be reading this blog because you are a follower of Jesus. Or you may wonder what it means to follow Jesus but are unsure how to start. You could start by planning to attend a Christmas service at a church near you. 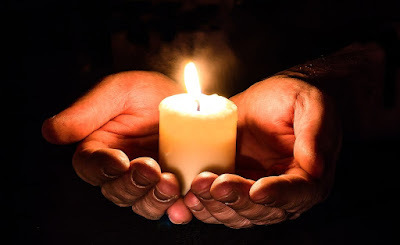 One Advent theme is finding light in darkness, hope in despair. Today's word for reflection on this 4th day of Advent in the #AdventWord2018 online calendar is #night. In the Northern hemisphere, the Advent season falls at a dark time of year, with short days and long nights. 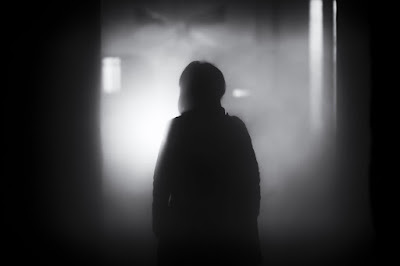 The long #night of winter darkness affects us physiologically and emotionally. Darkness can also be a metaphor for hopelessness, for oppression, for feeling lost and seeing no way out whatever pit we find ourselves in.